As per ASTM D 1238 & ISO 1133 ( Test Method A-Manual ) to check Melt Flow Rate (MFR) of Thermoplastics & Compounds. • Micro processor based auto tuned PID controller with temperature range from ambient to 400ÂºC, resolution of 0.1ÂºC and accuracy of ± 0.1ÂºC. • Timer : Digital presettable with a range up to 999 seconds and having buzzer output. • Weights : 2.16 kg & 5 kg. 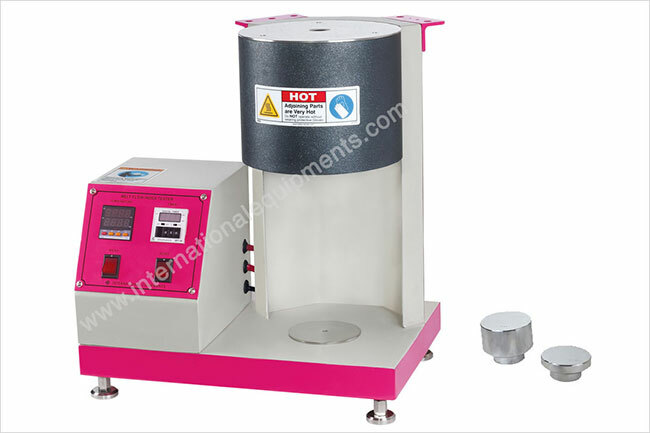 Digital Melt flow index tester as per method A of ASTM D 1238 with manual auto cutting facility.This model is an entry level basic model and complete operation is manual. The equipment has accurate PID controller and digital timer. MFI being a very essential gateway for most of the polymer industry, small sector users can opt for this model since it delivers accurate results at economical budget.